Want to get the best deals on metal building prices and know the facts to consider when buying? We’ve got you covered with real-time pricing updates on metal buildings; you can start at 32’ and go to 60’ feet wide with commercial metal buildings, all at the best price! 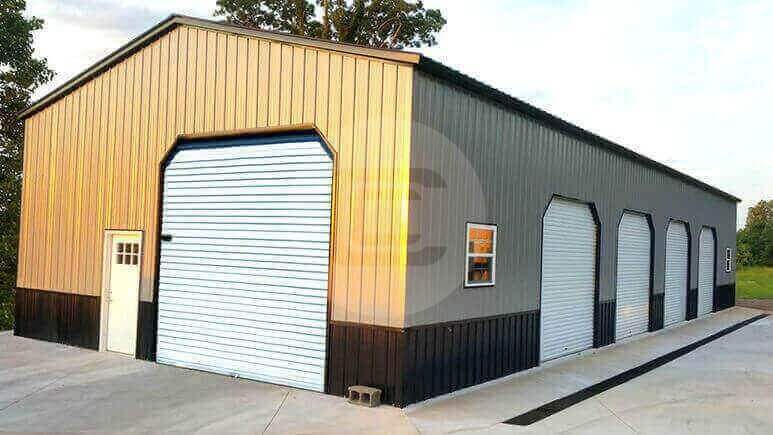 We provide a complete list of metal buildings at affordable prices in the Southern states, Northern states, and Florida. Have you ever drove by a neighbor’s house and felt envious as you watched them party outside in their metal building? Well, with us you won’t have to worry about this anymore! Not only do we have a wide variety of custom metal buildings, but we will find the one to suit all your needs and budget! Carport Central is THE leading provider of top-quality metal garages, custom metal buildings and commercial metal buildings at the most affordable prices throughout the country. Steel buildings are a great option when it comes to functionality and adding value to your property. One metal structure can have many uses, from workshops and storage to areas for family gatherings. With the superior service and wide range of available customizations, there’s no limit to the possibilities! Carport Central isn’t just about buildings and structures, we’re about the people we serve. We work with some of the best custom steel building manufacturers in the industry in order to get you the highest quality, American-made metal buildings at unbeatable prices! We believe that customization is essential to helping you fulfill all your metal building needs. The price depends on the customization’s and additional accessories you add to your prefab building. Metal buildings can be built with varying lengths, widths, and heights. Starting with the industry standard of 21’ long, you can change the length to meet your requirements too. Width begins at 12′ and can go up to 60′ with the proper support. The height of your metal building can begin with 8’ and go to 20′. 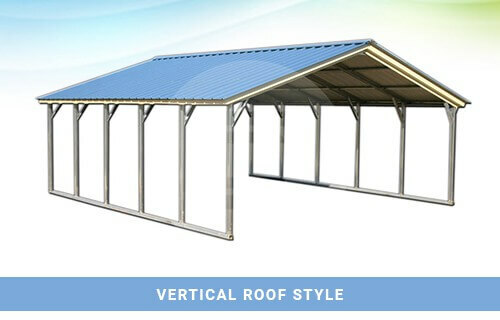 This roof style is the most economical option we offer for metal buildings. This style will protect your valuables and vehicles out of the sun, and the corrugated sides will help keep them out of the rain. 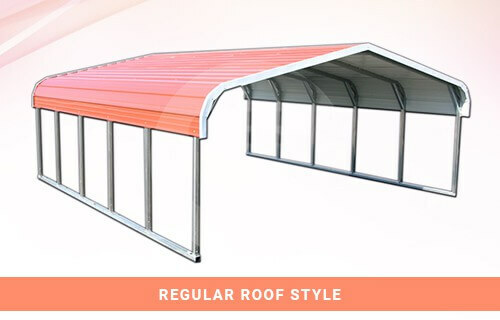 This is the second most popular and economical option offered at Carport Central. The difference between this roof style and the regular roof is their frames. This is our most popular and highly recommended roof style, its best for any building longer than 36’. 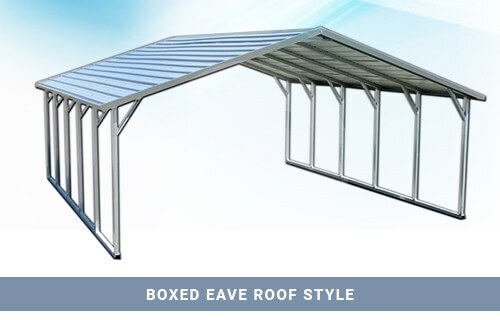 It’s sturdy enough so that heavy snow or rain will not cause any damage, and the combination of corrugated ridges running from top to bottom with vertical panels helps to protect any vehicles or stored items. We offer two choices for framing for customers to choose from, 12″- or 14”- gauge. We also have a 20-year rust-through warranty on both framing sizes. There are still more customization options available for your dream metal building, all of which have a contribution to the cost. Do you want any walk-in doors or roll-up doors? What about windows for some natural lighting? This is the best part of being able to customize your own metal building; you get to do anything you want! Including a roll-up door can add convenience and security all at once, just drive your vehicle in and lock it up! All this is possible. As you can see, we have the best products available for you to utilize the perfect space. We offer around 15 different color choices for metal buildings, all of which you can mix and match. 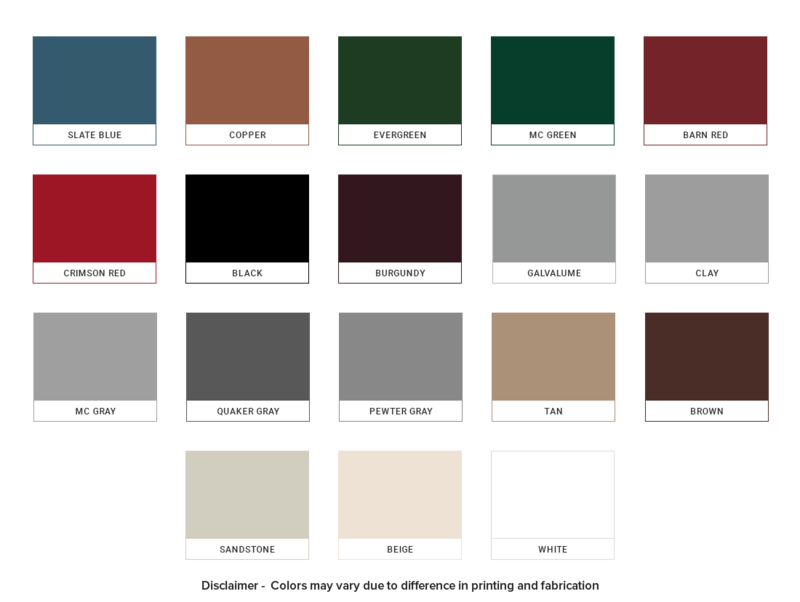 Color can be applied to the roof, trim, walls and garage doors. The color selection does NOT add any additional expenses to the total cost of your building. Contact one of our friendly building specialists today at (980) 321-9898 to learn more about what colors are available! While wooden buildings are susceptible to water damage, rotting, and termite infestations, metal buildings can stand up to all these possibilities. Often after a flood or hurricane, you can see metal buildings standing where wooden buildings have not survived the force of the water. Heavy snow loads, high winds, and building permits are factors in deciding if you should purchase a certified or non-certified metal building. Certified metal buildings are engineered to meet specific regional requirements for snow loads, winds and building permits since they require more structural integrity than a non-certified building. You should check with the legal authorities of your area before buying any metal building, especially in the Northern region and Florida. Carport Central’s team members are always ready to help you with any inspection and certification that your area may require. Just be sure to inform your building specialist and we will provide the building plans as well as anchors if they are needed. Our metal building prices are much more affordable than people think, starting at just $1,100, who could beat that? There are several metal building payment options that you can choose from at Carport Central; flexible financing options where you can purchase outright or our rent-to-own program. If you choose our rent-to-own option, you will have 36 months to pay off your building, you can also pay it off earlier if possible. Your final pricing will depend on customization’s, regional certification and gauge requirements, so be sure to give us a call today at (980) 321-9898 to speak with one of our friendly building specialists. With the best product catalog in the industry, Carport Central offers a simple ordering process. We walk with you from beginning to end, step by step, through selecting, customizing and purchasing. Unlike expensive wooden structures, which deteriorate over time and require frequent upkeep, our 12”- and 14″-gauge galvanized steel buildings are manufactured to withstand elements across the United States over the long term. You can enjoy your investment better knowing that we offer strong workmanship and manufacturer warranties with every building. As you can see, there are many benefits to metal buildings. Being surprisingly affordable and providing you with more storage, entertaining space, or that perfect workshop! With easy payment options, years of experience and a dedicated team, you can see why Carport Central is the top dealer for metal buildings! Don’t let envy cloud your thoughts any longer, call us today to get a metal building of your own! You can reach Carport Central at (888) 409-5187 or you can inquire on our website. Our building specialists are ready to help you with any questions or interests you may have!